a pre-1977 K-Ar, Ar-Ar and Rb-Sr ages recalculated using the decay constants of Steiger and Jager (1977) Ages in millions of years (Ma) before present. The relatively high quoted age precision of the structure was obtained from a single impact related rock sample (breccia with a melt matrix). Based on this, the age should be viewed with caution (Grieve 2006). 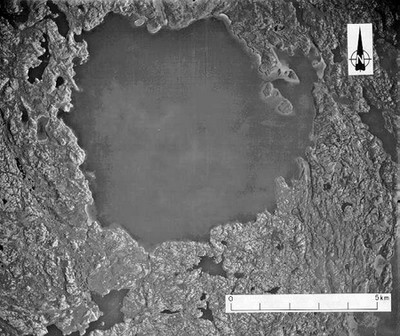 Pilot Lake Impact Crater from GOZooM at 3000′ AGL. The Pilot Lake “impact crater” is underwater in a pristine fresh-water lake that covers 43 square kilometres and is 90 metres deep. 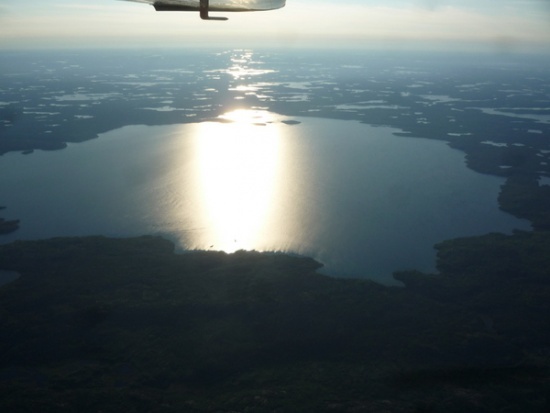 Lake trout, northern pike, whitefish and pickerel are plentiful, supporting a summer market for recreational fishing. 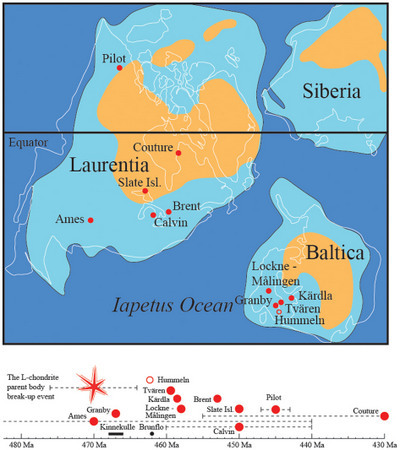 Paleogeography of Baltica and neighboring cratons at the time of the increased cosmic bombardment following the ~470 Ma asteroid breakup event illustrating the resulting known craters (red dots). Clearwater East is dated to this event (~460–470 Ma). Light blue color represents areas of shallow epicontinental seas, and dark blue areas of deep ocean. This distribution may, however, have varied somewhat due to periodical transgressions and regressions of the sea. The timeline documents the related meteorite falls (black dot and line). ABSTRACT: Approximately 470 million years ago one of the largest cosmic catastrophes occurred in our solar system since the accretion of the planets. A 200-km large asteroid was disrupted by a collision in the Main Asteroid Belt, which spawned fragments into Earth crossing orbits. This had tremendous consequences for the meteorite production and cratering rate during several millions of years following the event. 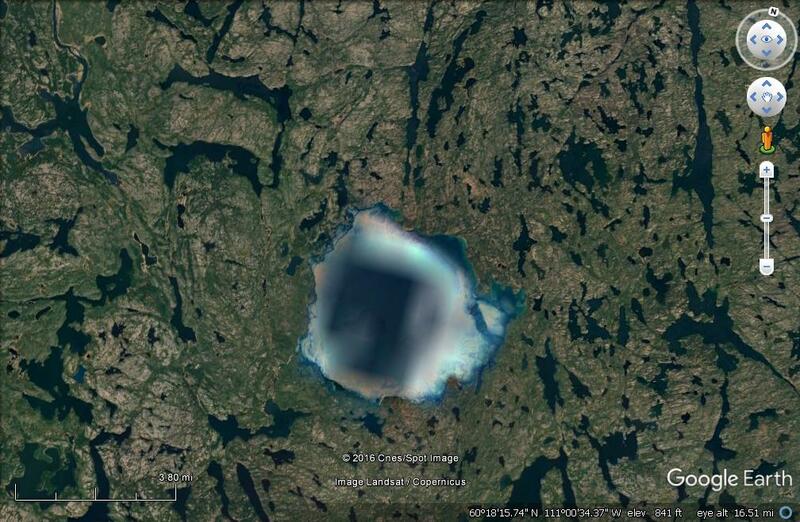 The 7.5-km wide Lockne crater, central Sweden, is known to be a member of this family. We here provide evidence that Lockne and its nearby companion, the 0.7-km diameter, contemporaneous, Målingen crater, formed by the impact of a binary, presumably ‘rubble pile’ asteroid. This newly discovered crater doublet provides a unique reference for impacts by combined, and poorly consolidated projectiles, as well as for the development of binary asteroids. 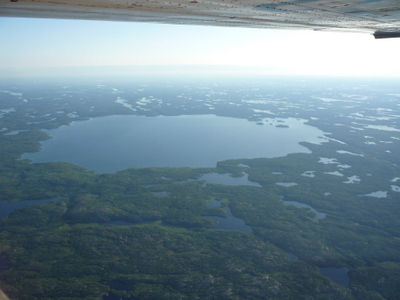 Pilot Lake Impact Crater from the north-west. 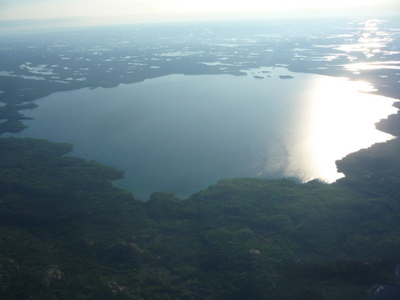 Pilot Lake Impact Crater from the west. 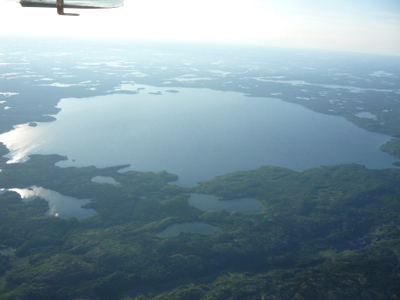 Pilot Lake Impact Crater from the south. 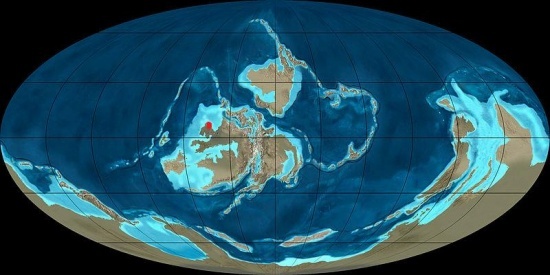 The red dot represents the approximate area of the Pilot Lake impact 445 million years ago in the Ordovician Period. At that time CO2 was at 17 times that of present levels and the first terrestrial moss-type (bryophyte) fossils appear. 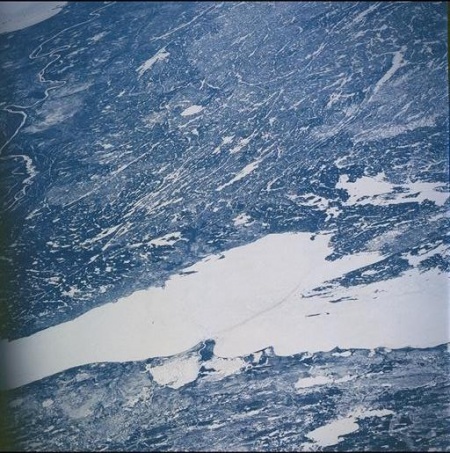 Evidence that Pilot Lake, an eroded impact structure, was collected in 1965. Planar deformation features in quartz occur in some of the discovered brecciated gneiss boulders found around the site (Grieve 2006). 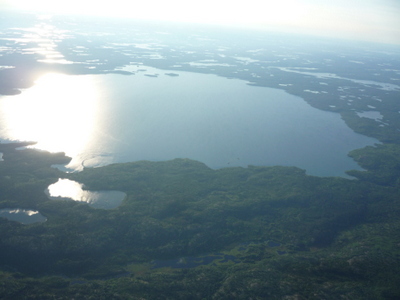 The lake depths were found to be larger than for neighboring lakes. The bottom was found to be nearly flat and covered with sediment. 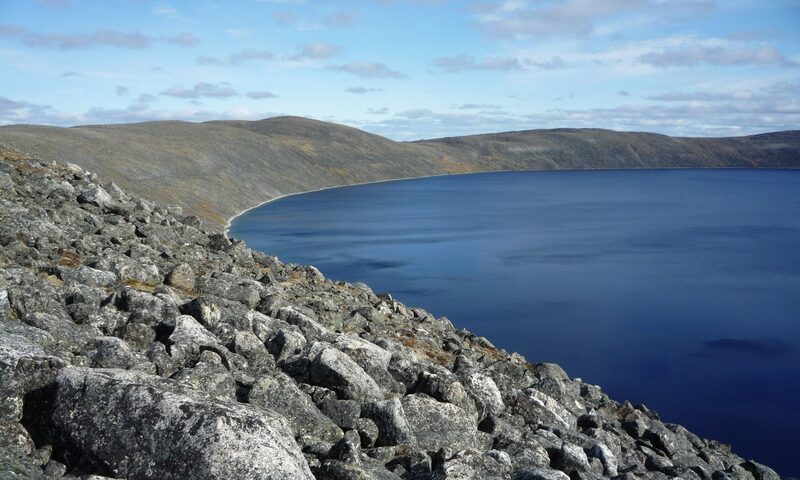 On the western lake shore granite gneiss was found, conspicuous because of its highly fractured condition, similar to the rocks found around the Brent crater. Microscopic examination of the rocks revealed PDF, and the small pieces of impact breccia was similar to the Brent breccias (Hodge 1994). 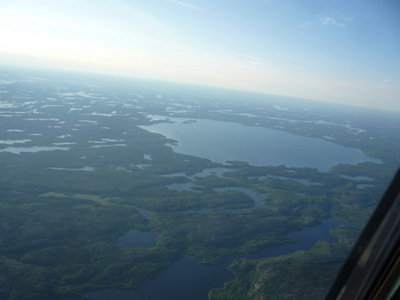 We took these images of the Pilot Lake Crater flying in from the north and leaving the area to the south. 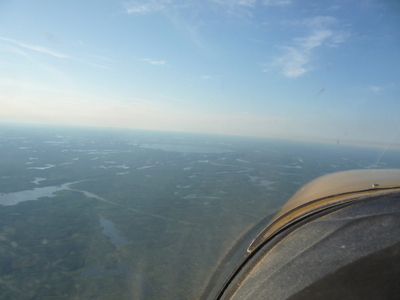 As illustrated in the images we took while flying over the structure, the lake is an excellent “sign post” for pilots flying over the area. Dence, M. R., Innes, M.J.S. 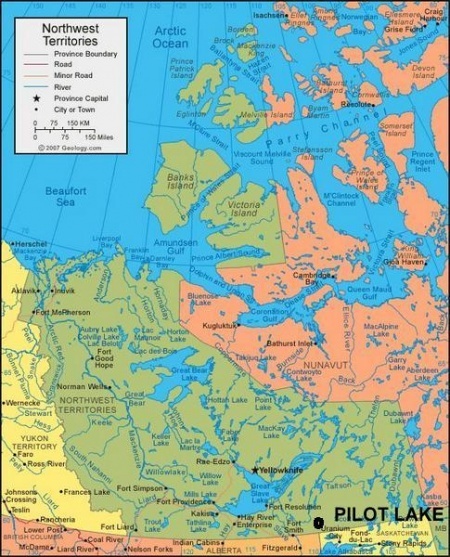 and Robertson,P.B., Recent geological and geophysical studies of Canadian craters. in Shock Metamorphism of Natural Materials, eds. B. M. French and N. M. Short, Mono Book Corp., Baltimore, MD, pp. 339-362. 1968. Grieve R.A.F., Impact structures in Canada, Geological Association of Canada, 2006. Hodge, P. Meteorite Craters and Impact Structures of the Earth, Cambridge University Press, 1994. University of New Brunswick, 2012.